"New local government pensions proposals released"
UNISON press release here "The Local Government Association (LGA) and trade unions have today announced the outcome of their negotiations on new LGPS proposals (for England and Wales) to take effect from 1st April 2014. These proposals will now be communicated to scheme members, employers, funds and other scheme interests. Unions will consult their members over these proposals and the LGA will consult employers. The government has confirmed that a favourable outcome of our consultations will enable them to move directly to a statutory consultation later in the Autumn to implement these proposals. 1 A Career Average Revalued Earnings (CARE) scheme using CPI as the revaluation factor (the current scheme is a final salary scheme). 2 The accrual rate would be 1/49th (the current scheme is 1/60th). 3 There would be no normal scheme pension age, instead each member’s Normal Pension Age (NPA) would be their State Pension Age (the current scheme has an NPA of 65). 4 Average member contributions to the scheme would be 6.5% (same as the current scheme) with the rate determined on actual pay (the current scheme determines part-time contribution rates on full time equivalent pay). While there would be no change to average member contributions, the lowest paid would pay the same or less and the highest paid would pay higher contributions on a more progressive scale after tax relief. 5 Members who have already or are considering opting out of the scheme could instead elect to pay half contributions for half the pension, while still retaining the full value of other benefits. This is known as the 50/50 option (the current scheme has no such flexible option). 6 For current scheme members, benefits for service prior to 1st April are protected, including remaining ‘Rule of 85’ protection. Protected past service continues to be based on final salary and current NPA. 7 Where scheme members are outsourced they will be able to stay in the scheme on first and subsequent transfers (currently this is a choice for the new employer). All other terms remain as in the current scheme. Future scheme costs will be monitored and controlled to ensure stability and affordability of the LGPS. Further details on cost management and scheme governance will be released once the ongoing discussions in the next part of the LGPS 2014 project are complete. “The negotiations over LGPS 2014 have been long and tough and have taken place in a demanding political and economic climate. The process has shown that UNISON, the LGA and the other local government unions can work productively together in the best interests of LGPS members and potential members. Picture from this morning's UNISON London Regional Council of Laurie Heselden from SERTUC briefing delegates on the demo. The TUC are planning a major national demonstration in London on Saturday 20 October. The march will be called "A future that works" and its focus will be to end the austerity polices that have sent the economy back into recession. Laurie helped organise the successful "March in March" and the demonstration on 30 November 2012. He believes for it to be another success then we need to get even more than the 500,000 people we got in March out on 20 October. A communications website www.afuturethatworks.org.uk will be up and running before the summer break. An email group has been set up for union organisers and "...of course (we will use) twitter, both in advance and on the day". Laurie made a plea for more stewards to put themselves forward. I will probably be marching with my branch but I will be working with Newham Labour Group, TULO and trades council to encourage and maximise the Newham Labour Movement family to march together again on 20 October! As they say - watch this space as there will be lots and lots more on this event to follow. Last Thursday I went to a seminar by the President of the Australian Congress of Trade Unions Geradine (Ged) Kearney at Congress House. The event was sponsored by TUC international office and Unions21. Ged has a nursing background and gave a honest and articulate appraisal of the Labour Movement in Australia (they have a Labour Party and affiliated unions in a similar way to the UK). The current Labour Government is in trouble in the polls and Ged fears a Conservative victory in the next General election. Despite being only a minority government it has done a lot of progressive things such as the Fair Work Act. While they wish the Labour Government had done more, they dread the return of a Conservative government. One campaign issue in the future by the unions will be to try and help build a truly progressive space for the Labour Party to step up to and fill. I asked a question about the trade union run pension funds in Australia which I understand are very successful but currently under attack. Ged replied that they are a success story with the fund she helps manage worth over $20 billion yet the market has always been "pissed off" (Aussie for upset) by the idea of workers controlling their own capital and there has been constant attacks on union pension funds for no reason whatsoever. I'm not sure how long Ged is in the UK but if you get a chance to go and see her speak I would recommend it. Update: I am reliably informed that Ged is now at the ILO in Geneva and is then going home but no doubt she will return to the UK at some time in the future. Check Owen's more detailed and complete report of this meeting at Stronger Unions. 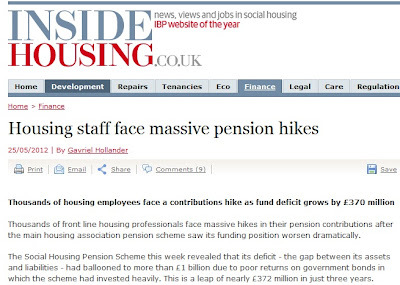 Molins to Workforce: give up your pension...or else! It was another bad week for employees last week. At around the same time that the Conservative hedge fund multi-millionaire and sponsor, Beecroft, published his report recommending that companies should be able to sack their employees if they don’t like them, Molins, a FTSE listed UK engineering company was found to have threatened its workforce with the sack if they don’t leave their pension fund! They decided to close their scheme but their trust deeds did not allow it. So they have issued a section 188 notice to the government saying they are intending to dismiss everyone and then offer to re-engage them on condition that they do not join the pension scheme. Molins claims that that they cannot afford to run its existing defined benefit scheme. Which is rubbish. It is making good profits and is financially secure. Pension’s Week suggest that there may be a problem with attracting investment but that is not what they are telling their workers. I think it is just cost cutting and they want to cut the wages of their employees with a substandard pension contribution which will not be enough to give their workers enough money to have security and dignity in their old age. “This is a test to the 2006 pensions regulations, which quite clearly state an employer’s consultation with the workforce has to be meaningful,” said John Gray, Association of Member Nominated Trustees (AMNT) committee member. The AMNT has launched a campaign to support trustees of DB schemes under threat of closure. What Molins has got to realise is that closing their pension scheme will not make their liabilities disappear. It could make things much, much worse. Current Pension deficits are worked out using a completely artificial and discredited accounting standard called “mark to market”. Due to a double whammy of recent exceptionally low fund management returns and a 200 year low in the yield of gilts make things appear far more negative than they actually are. Not only that but if you panic and close your scheme in response to these meaningless figures then the company faces having to pay even more into the scheme since the fund rapidly becomes cash deficit and has to invest into low yielding bonds and gilts with no equity premium. Ironically last week I goggled “Molins” and “Pensions” and came across this story from "The Independent" business pages in 1992. The Molins pension scheme was then in surplus by £90 million. The company was trying to take out £18 million out of the pension scheme to cut company debt and fund acquisitions (and increase benefits). I don’t know if were able to take this money out of their scheme but if they did what would have been the scheme funding now if they did not take out £18 million in 1992? Off message but went on marvellous walk today along the Thames Estuary. Weather was hot and sunny but there was also a perfect breeze. This is not an entirely "pretty" country walk. There is a constant contrast between the industrial heritage and natural marsh land beauty. It is also very quiet and isolated despite being opposite to Gravesend and so close to London. Stopped off for a visit and a guided tour of the 19th Century Coalhouse Fort. One of the so called "Palmerston Follies" built to defend the UK against the French but never fired a shot in anger until being used by anti-aircraft batteries during the first and second world war. Towards the end of the walk was the abandoned British Bata Shoe Company striking modernist building which was the basis of a model town built in the 1930's by Czech entrepreneur, Tomas Bata. Hat tip to Essexwalks.com for the walk itself. This is a fantastic free site for downloading walks and maps. This walk was overgrown in parts due to the recent rain, sunshine and selfish farmers and in the "growing season" for fear of red and scratched legs I would not suggest shorts and open walking sandals (which of course I was wearing today). 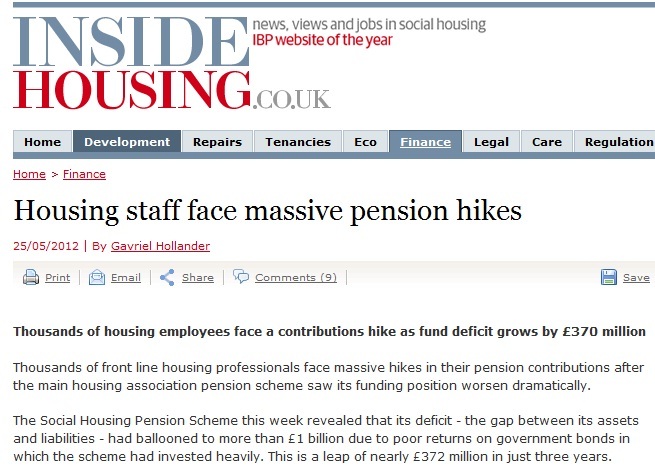 I was contacted by "Inside Housing" (trade magazine for Social Housing) this week about possible significant increases in pension contributions for members of the Social Housing Pension Scheme (SHPS). What I told them is hardly rocket science, but after years of below inflation wages increases (and savage cuts in care and support) if the cost of pensions go up then members will leave the scheme. Can I recommend that if anyone learns that their employer is considering increasing contributions or closing their scheme to contact their trade union. UNISON is in the process of organising a meeting with the Social Housing Pension Fund and also will want to meet with employers. Please remember that this “deficit” is an accounting figure which is almost entirely bogus and due a double whammy of recent exceptionally low fund management returns and a 200 year low in the price of gilts. Some things might have to change but defined benefit schemes are as affordable now as they have ever been. Housing associations should not panic. They will only run the risk of making the deficit seem even worse if they do. Instead they should meet up with their unions and negotiate a way forward. Sorry Stuart but it would not be a pragmatic step to consider closing the scheme nor raising contributions significantly. It could make things very much worse. This “deficit” is completely artificial and discredited accounting figure due to a double whammy of recent exceptionally low fund management returns and a 200 year low in the yield of gilts. In housing management we see first hand the awful consequences of poverty in old age. Defined benefits schemes gives dignity in retirement for millions and should remain as the cornerstone of decent occupational pension provision. WHAT IS THE SPIRIT LEVEL? “The Spirit Level” is an award-winning book which uses rigorous analysis of 25 years of research to show how a more equal society is better for all of us, including the rich. It shows how nearly all social ills - stress, poor educational performance, high crime rates, unwanted teenage pregnancies - are more common in those societies with a big gap between rich and poor. It has been published in over 20 countries, has sold over 100,000 copies in the UK and won first prize in the Bristol Festival of Ideas. 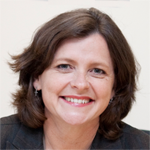 Lynsey Hanley in the Guardian said, It’s impossible to overstate the implications of (this) thesis", The Economist stated “It is a sweeping claim, yet the evidence, here painstakingly marshalled, is hard to dispute”. The New Statesman listed it as one of their top ten books of the decade. It’s impact has been so great that it has provoked numerous attacks from organisations that support low taxes for the rich such as the Taxpayers’ Alliance (“we oppose all tax rises”) and Policy Exchange (“the most influential think tank on the right”)"
This was very informative and well organised conference taking place during an absolutely crucial time for the future of the local government pensions scheme (LGPS). I was there as a Councillor and member of the Borough LGPS Investment and Accounts committee. I did “twitter” (in my case a very apt term?) during the conference (see hash tag @grayee and #napf). 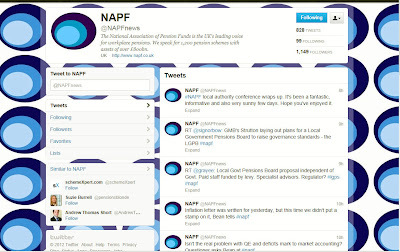 The NAPF had amongst many other speakers the minster responsible for the LGPS, Bob Neill MP, the Deputy Governor of the Bank of England, Charlie Bean; the Chair of the Local Government Association, Sir Merrick Cockell (who in a Q&A I referred to as “Michael”) and from the unions, GMB national secretary Brian Strutton. 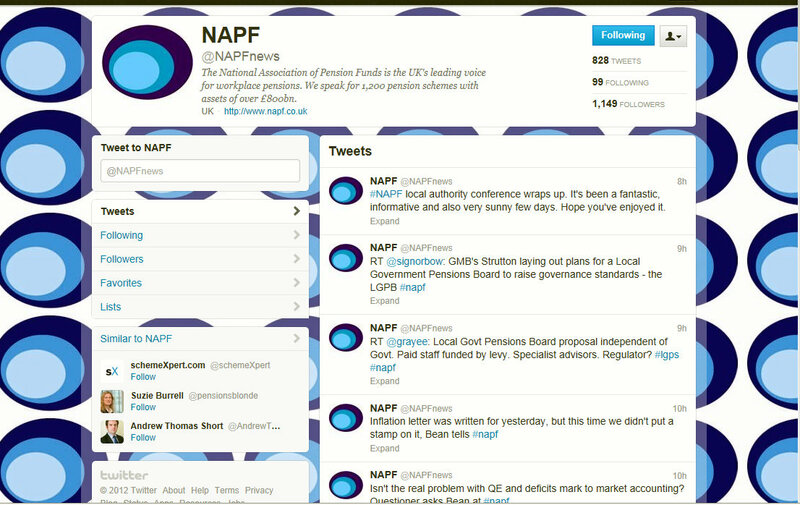 The Chair of the NAPF is Joanne Segers. By coincidence the first ever trade union pension course I ever went on was delivered by her father, TUC tutor Terry Segers. Proper old school ex-fire brigade union. Considering the number of forthright and opinionated individuals present at the conference, the Q&A sessions were quite quiet, which gave a opportunity to a certain gobby part time politician and union rep to somewhat hog the floor during questions. There was clearly an expectation by speakers that the future of the LGPS negotiations would have been finalised by now. But there is some last minute hic-cups. This is immensely frustrating but I suppose they do want to make sure, as far as possible, that there is no misunderstanding or ambiguities about the “agreement”. The ultra left trade union cry babies (the so called 0.8%ers) are of course still weeping tears at the prospect of no more strike chasing to bring about the revolution but we should have the final offer very soon. It was good to see at the final session that the conference applauded DCLG pensions lead, Terry Crossley, who is retiring from the civil service. I have crossed swords (politely) with Terry for the past 10 years or so over beneficiary representation on the LGPS. I wish him well in his retirement and told him that if a deal is reached on a new look LGPS then he should have a new part time job and go out and sell the model to the private sector who are in desperate need of affordable and sustainable defined benefit pension schemes. 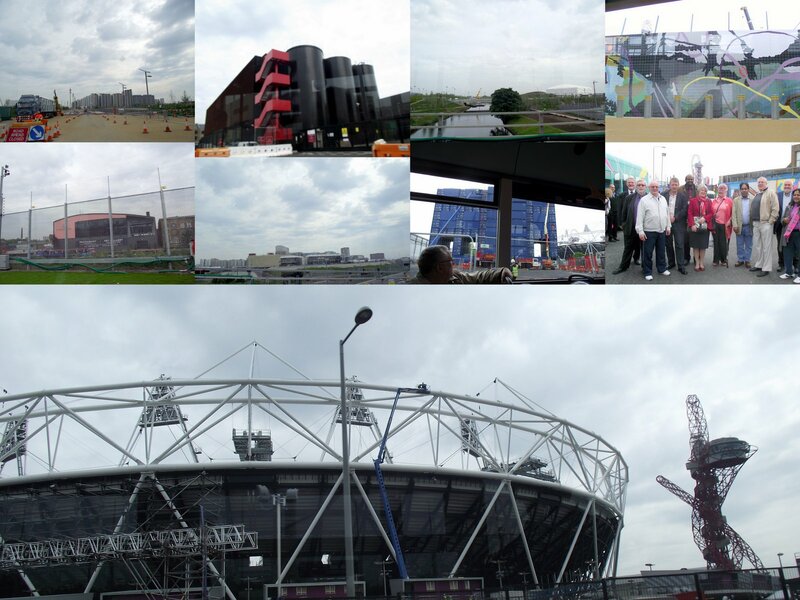 Early on Friday last week I went on a guided coach tour of the London Olympics 2012 site. This is the 3rd tour for Newham Councillors I have been on I think since I was elected in May 2010. The change in the last 2 years alone has been remarkable. I also use to run/cycle into work and back through the site for many years before that. That change is simple breathtaking. Beforehand the area was an industrial estate dominated by scrap merchants, sweat shops, electric pylons and burnout buildings. There was some decent businesses but the area was known for the number of work related deaths and serious accidents. It is now like being on a different part of the planet. Click picture to bring up detail. I'll post some better ones on Facebook later. This tour saw that the main Olympic stadiums and athletes village is pretty much complete but there is plenty of ongoing work going on to build the temporary buildings and sponsor concessions. The more I see of the green spaces, the trees, the flowers, the footpaths and waterways, the more I look forward to the post Olympic Queen Elizabeth Park. This picture is from the UNISON Community Service Group Executive meeting earlier this month at the UNISON Centre. In the middle is Stephen Brown, who was our first ever Chair of what is now the 3rd biggest Service Group in UNISON. Stephen was our senior lay activist who did more than anyone to bring about our own sector specific internal organisation. Stephen was a thoughtful and considerate Chair who always sought to bring about consensus and agreement whenever possible. However, as branch secretary of Quarriers UNISON branch he helped organised and fight his employer over proposed massive pay cuts which resulted in strike action. Stephen was recently made redundant but was successful in an interview with UNISON and will start his new job soon. A result for the union I think. Left to right in photo is our new National officer, Simon Watson (who took over from Mike Short); Kevin Jackson from Eastern region, who has taken over as Chair; Head of Community, Dave Johnson and finally but not least our top assistant national officer for Community, Jane Ellis. Who is also we understand planning to leave for a new job in Eastern Europe. Tired of Banker’s Bonuses? 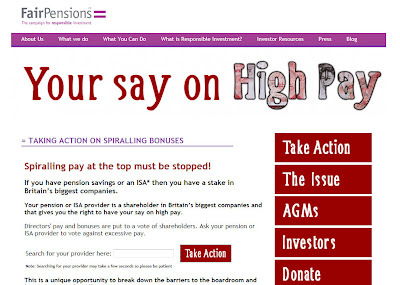 It’s about time we all Have Our Say on High Pay! 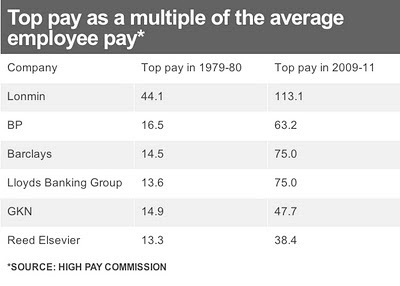 "Over the past decade, while executive pay has grown by over 323%, the average UK earnings have grown by a mere 54%. Across the nation, ordinary workers have felt outraged by the continuing gap between the lowest and the highest paid earners but felt powerless to do anything. This growing inequality is particularly distasteful considering the current economic situation, with high unemployment and pension cuts creating hardship for many. But how can we tackle this culture of excess? Vince Cable thinks that it is up to the shareholders of companies to hold the boardroom to account. 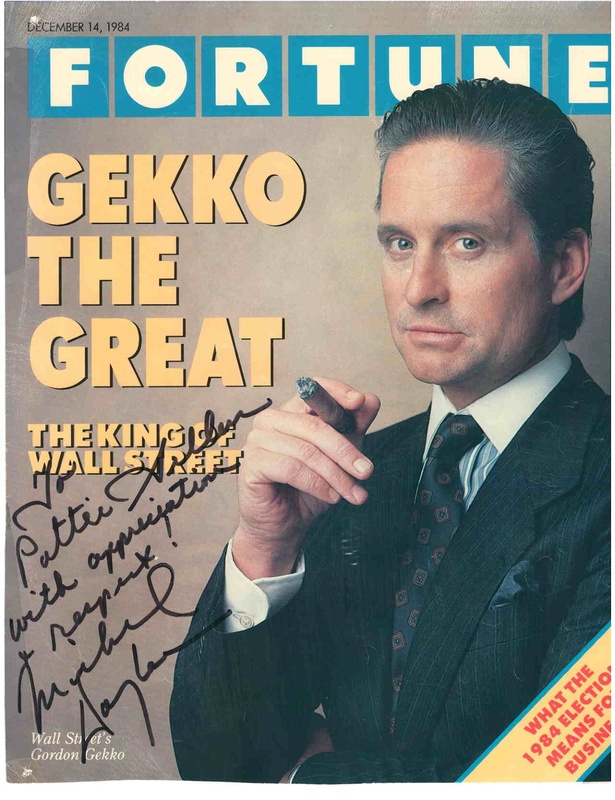 However, despite the vast increases in bonuses and single performance incentives, not to mention “Golden Hellos” (a hefty sum paid to attract talent to the company), average levels of shareholder dissent have been stuck at around 9%, with outright defeat for these pay packages at annual general meetings remaining a rare spectacle. We all have the power to influence these shareholders, who are mainly compromised of institutional investors. These anonymous ‘institutions’ are, among others, the pension funds and insurance companies who look after our retirement savings. In other words, the owners of corporate Britain are no longer a few rich individuals: they include anyone with pension savings, or around 11 million of us. This is our money! 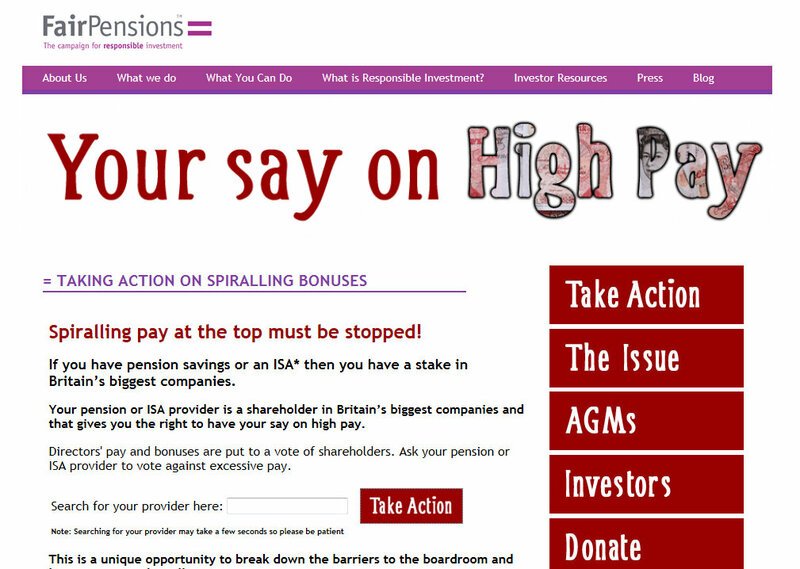 The responsible investment charity FairPensions has launched ‘Your Say on HighPay’ at www.fairpensions.org.uk/highpay This online action tool will email your pension fund or ISA provider telling them you want them to vote against excessive pay – and asking them to let you know about it. Whether the ‘Shareholder Spring’ proves to be a one-season wonder or something more permanent may yet be up to us". (Great guest post by MM). Last night (Thursday 17 May) was the London Borough of Newham Annual Council meeting. It was held in our historic Stratford Town Hall. It opened with live classical music from some of the 7000 Newham Primary school pupils who had benefited from the Council's "Every Child a Musician" programme" followed by the formal Council business. This included a motion to better regulate the blight of Betting Shops (bookies) on our High Streets moved by Cllr Neil Wilson (and seconded by myself). Then speeches by Sir Robin Wales, our Executive Mayor, honouring Cllr Alec Kellaway (the Chair of our Pensions Committee) for his 25 years of service and Cllr Conor MacAuley for his 30 years! 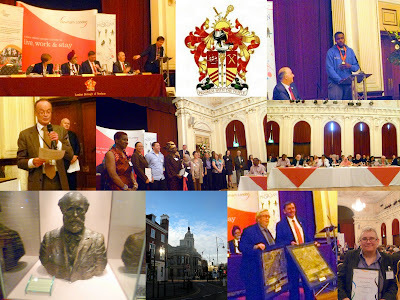 The Newham Young Mayor and the (Old) Mayor Sir Robin Wales both gave speeches. Robin reminded us there was only 71 days before the start of the London Olympics and how the eyes of the world will be on Newham. I was really pleased that the meeting also honoured all those Newham Residents who had been nominated for Inspiring Peoples Awards. Kim Stevens, who is one of the tireless volunteers who runs the Vicarage Lane Community centre in West Ham ward (see Kim in collage bottom right) was so nominated and she had been honoured with tickets to the Olympics 100m Sprint Mens final! Well done Kim and well deserved for all your hard work to the local community. Of course Keir Hardie (bottom left) the first ever Labour MP elected in this same Town Hall for West Ham South on the 4th July 1892 as ever kept a careful eye on events. "Muhammad Shahid Nazir works on a fish stall in Queen’s Market, near to the Olympic Stadium. He is now in talks with a record label and has also auditioned for the up-coming X factor 2012. “I feel very good and can’t believe everyone is singing the song,” said Mr Nazir. “It’s become famous. “West Ham football supporters often stop here and tell me they’ve come to hear me sing as well as watch the match. “Once a head teacher told me that his whole school is singing the one pound fish song. “My mother prays for me and encourages me to pursue my dream of becoming a singer. Singing has always been my childhood hobby and I want to make a career out of it,” Mr Nazir told BBC. This event will celebrate the 160th anniversary of the birth of Will Crooks:- Trade Unionist, the fourth Labour Member of Parliament and first Labour Mayor of Poplar. Speakers will include Nick Raynsford, Member of Parliament for Greenwich and Woolwich and David Edgar, councillor for Limehouse. RSVP to: ramona.iosip@canarywharf.com or 020 7418 2462. Check out Will Crooks and Pathe News (above) of his funeral in 1921. 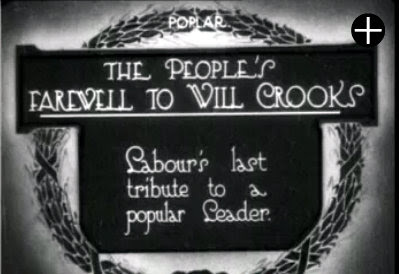 Quote about Will Crooks "I once heard him say that a non-Union workman who tried to gain personal advancement at the expense of his mates was like a man who stole a wreath from his neighbour's grave and won a prize with it at a flower show!" If you have a heart attack then the best chance of you not dying on the spot is if someone can get a defibrillator to treat you within 5 minutes. For every minute after an attack your chances of survival without such treatment drops by 14%. CPR (cardiopulmonary resuscitation) and "mouth to mouth" is still important as a last resort but in comparison with defibrillators this does not save as many lives. Defibrillators are small hand held safe electronic devices that automatically diagnoses life threatening conditions and applies a treatment that can restart someones heart. It saves lives without further risk to the person you are helping or yourself. There are no real legal risks for you or your organisation (unless you are completely stupid and act in a grossly negligent manner). 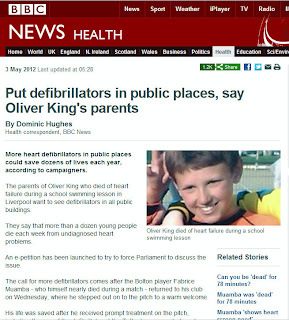 I have signed up to this public e-petiton call for all public buildings to install defibrillators and train staff. 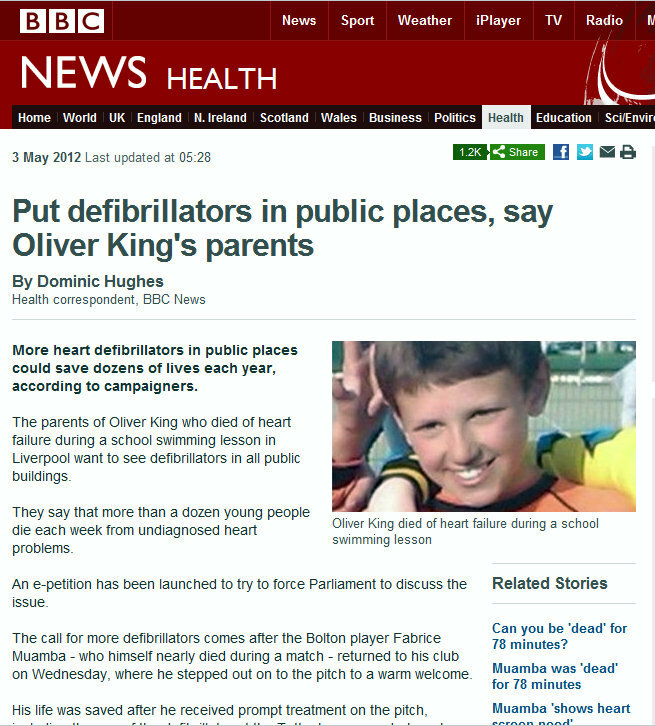 This petition came about after the tragic death of teenager Oliver King and points out that it is not only older people who are at risk but 12 youngsters die every week from Sudden Adult Death Syndrome (SADS). The footballer Fabrice Muamba who dramatically collapsed in March was saved by a defibrillator. As I have mentioned before my father (aged 72) had a heart attack in a high street. He was given CPR and mouth to mouth by a trained first aider but was certified dead when he arrived in hospital (he was doing a 14 day long distance walk and camping out wild which he had been warned by his GP not to do so but that is another matter). 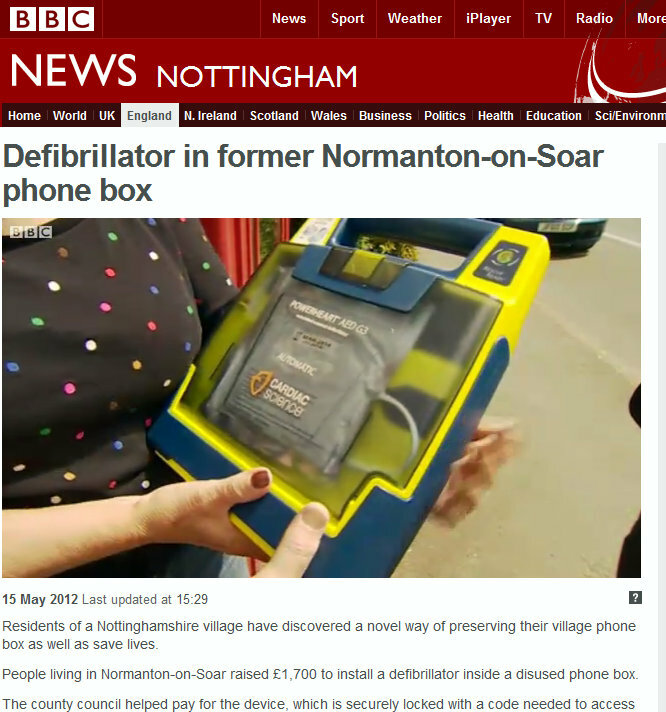 My family have wondered whether or not if a defibrillator had been available it would have made any difference? We will never know but the evidence suggests it could have done if carried out within this 5 minute window. I have spoken to Monica who is our Regional Equalities officer and a fully qualified NHS nurse who has carried out CPR and saved lives through defibrillation and Eric who is the very experienced paramedic branch secretary of the London Ambulance Service, both fully support lay people being trained to use defibrillators and they believe it will save lives. My employer at our joint health and safety committee has agreed to look into providing defibrillators at our offices and training staff. I would encourage all employees to do the same. NB To be clear if you come across someone who appears to be having a heart attack and there is no defibrillator available and you have not been trained to do CPR then follow the advice of my London Welsh compatriot Vinnie! Are current levels and rates of increase of executive remuneration fair and transparent? Are fund managers reflecting the views of beneficiaries in their engagement with companies on executive pay? What can pension fund trustees do to bring about improved practice in the area of executive remuneration? You are invited to discuss these and other questions at a free seminar for pension fund trustees hosted by the TUC and Fair Pensions taking place from 2pm – 3.30pm on Monday 21st May, in Congress House, Great Russell Street, London WC1B 3LS. Off message but today I went for a superb 8 mile walk in Hertfordshire. Only 40 minutes from Newham by car. Check out map and description here. Lovely rolling countryside. 2/3rd of the way around you walk through the Henry Moore Foundation Park. I must admit that I don't totally "get" Henry Moore. The sculptures are visually impressive and expertly crafted but really not my cup of tea. The large reclining figure 1984 (see above - double click to bring up detail) I did get. Two weeks ago I was in a traditional cafe in Tower Hamlets, East London meeting one of my trade union members who is off sick from work. While we were discussing his situation I was vaguely aware that some sort of disturbance had broken out in the street outside the cafe. Youths on push bikes seemed to be having some sort of a row. There was about 3 or 4 of them involved with some more hovering around. I wasn't really paying attention until I heard some women I knew shouting at them to stop and to break it up. Then I saw one youth carrying what looked like a scaffolding pipe who also tore off his tee shirt and threw it on the floor then ran off. I went outside and found out that one of the youths had been stabbed. On a street rubbish bin there was a blue tee shirt covered in blood with a small cut in its side. I rang the Police who were quickly on the scene and sealed off the area. I left them my details if they needed to take a statement from me. I saw the victim being treated by a paramedic further up the Street. I understand that his injuries were serious but not life threatening. What is wrong with our society? Why are our kids going around armed with knives in the middle of the day? 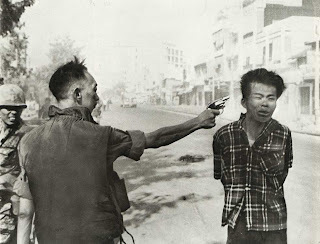 When I was young there were plenty of such stupid and pointless fights but the premeditated use of weapons amongst the young just by and large did not happen. This was not in any way a "golden age". There was far more unreported horrific domestic and child abuse in those days. I also as a young man growing up in the relative backwater of North Wales actually saw more senseless violence and knife crime than I have ever seen socialising in East London, but this was largely immature males in pub and nightclub drink and drug fuelled stupidity. The idea of 16-17 year olds on push bikes stabbing each other in the street in broad daylight over teenage petty macho nonsense just leaves me speechless. It was ironically not all doom and gloom. The local women who went out and challenged the youths and broke up the initial fight, the passerby who gave mouth to mouth resuscitation to the youth who had been stabbed, the number of people willing to speak to the Police and tell them what they saw. Don't get me wrong, this type of public violence is still very rare and exceptional and the evident shock that local people felt did show this. But what is the answer? The picture above is of "Get a life and bin a Knife" bins but surely there needs to be more than that? 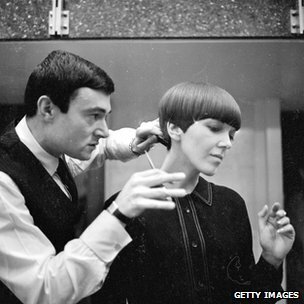 apprenticed as a hairdresser in Whitechapel at age 14.
icons of the swinging 60s. Early this year I heard him being interviewed on Desert Island discs. A complex man who had a very hard start in life but who did achieve material success due purely to his enormous talent and aptitude. I did not know him at all but I suspect he was one of those fascinating but ever so demanding charactors. I would recommend you listern to the interview with Kirsty. I've been meaning to post on this for a while. 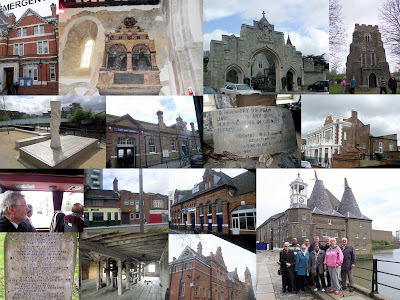 Last month I went on a bus tour of Newham Conservation areas and listed buildings with other Councillors. Newham has 9 conservation areas and 114 listed buildings or groups of buildings. The oldest dating from the 12th Century. Highlight of the tour was the Norman St Mary Magdalene Church in East Ham where we had a tour by its vicar (and local Councillor!) and Temple Mills. Near to Temple Mills was the scene of the famous strike in 1972 (Chobham Farm warehouse) which led to the Pentonville Five trade unionists being imprisoned (including Vic Turner who later became Mayor of Newham). Many thanks to the officers and local volunteers for organising a superb tour. The serious purpose of which was to make us aware of the rather complex and detailed planning regulations regarding historic buildings and conservation areas. board "to keep them honest". The background to this is the revolts by shareholders (or rather asset managers not by and large the actual share owners) at Company Annual General Meetings (AGM) over excessive and unearned top executive pay. Yesterday the boss of insurance giant Aviva was forced to resign after his pay package was rejected at its AGM. So were the bosses of drugs giant AstraZeneca and Trinty Mirror. Tomorrow apparently the British Gas Centrica CEO is also in big trouble. I must admit to agreeing with James Ashton's conclusion that the employee representation "model has been proved to work elsewhere in Europe. What better way for the chairman to keep in touch with the shopfloor than to have the shopfloor turn up in his boardroom once a month? It could make for some uncomfortable meetings". Update: I'll post on the campaign by Fair Pensions on how ordinary people can take action against executive High Pay soon. 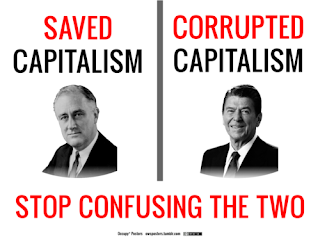 Guest post from Comrade Eitingon. "Dear John's Labour blog. 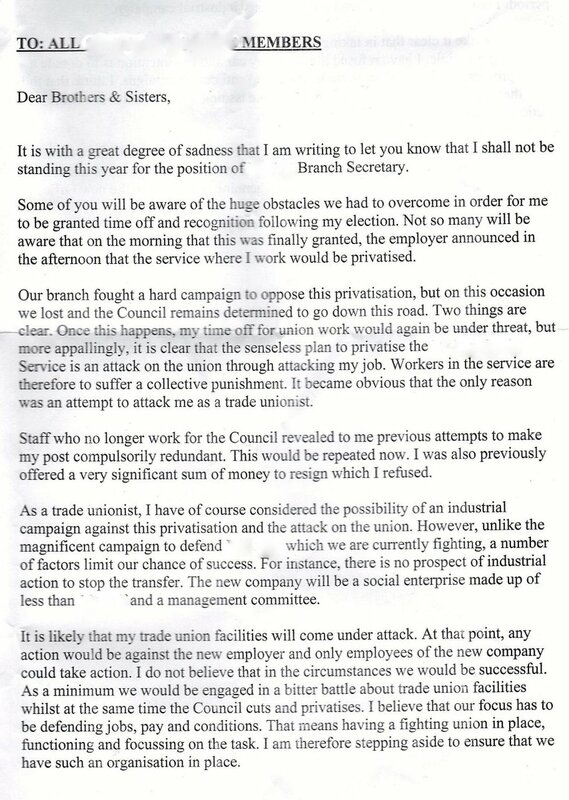 This letter (see scans left - double click to bring up detail) was recently sent to all members of a trade union branch. 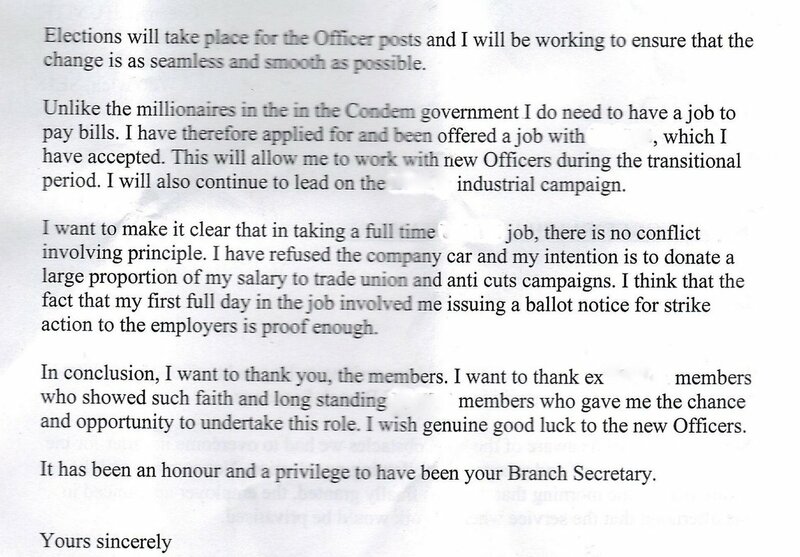 I was surprised to read that it was from its branch secretary, who announced that since his substantive job had been privatised by the Council and he would now not be able to have paid facility time off to carry out his union functions, he was giving up his job and joining a trade union as a full time official. 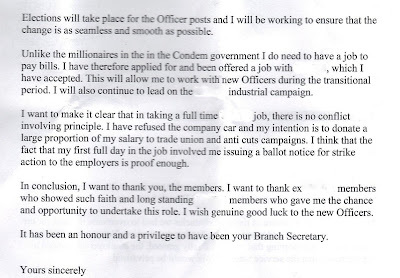 Now, I happen to think that it is a good idea that a trade union recruits from its lay membership but this branch secretary is a supporter of the ultra left sect SPEW, who has constantly attacked such "unelected" full time trade union officials as "bureaucrats". Yet he gives up being a lay rep to become a unelected full time official? What is wrong doing a worthwhile job while being a normal shop steward? Also a trade union rep should be there to protect and defend their members and if a service is being privatised then members need their union rep even more than ever. Surely the union rep should follow the members in order to defend and not just leave them in the lurch? your job was privatised John? Finally I understand that this strike ballot he called on his first day as a full time union bureaucrat had to be withdrawn - because he messed up the paperwork. UPDATE: Onay Kasab has claimed that he sent this letter. Check comments. Don't mention the ...Pension tax advantages on your P60! I've just been trying to work out what on earth my P60 actually means? To any non-Brits looking at this post, every year in the UK if you are employed your employer should send you a legal certificate showing your salary and how much you have paid in income tax and national insurance. It also use to show how much you paid into your company pension scheme. But for some reason - no longer? My P60 just shows my income for the year "net" of my pension contributions despite claiming to show my "total pay" for the year. Which is wrong since I know I earned more in that year than is shown on my P60. No wonder people get confused and don't know their true income nor more importantly, the advantages they may have from having a company pension scheme. One of these many advantages of a company pension scheme is that it is usually paid out of your income before the taxman has a go at it and what this means is that your tax bill is slashed if you have a pension. What this also means to your wallet or your purse is that your pension is bumped up for free by the taxman!!! Result! But you would not know that from your P60. It not only misleads you on your total income but it totally fails to show the benefit from being a part of a company pension scheme. Which is just plain daft and stupid. We should be encouraging people to save not only for their futures but also to save the State from forking out for those who retire with no private pension and then are totally dependant on the State. No Heart, No Brain, No Courage! 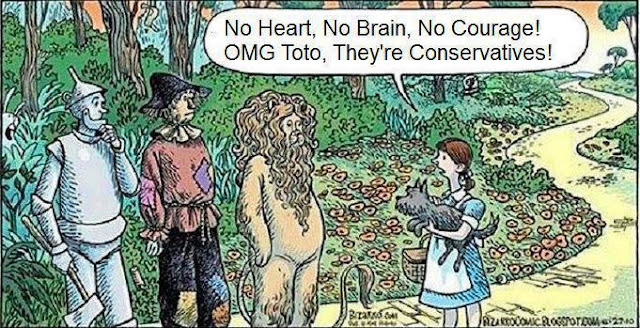 OMG Toto, They're Conservatives! Hat tip to the President of the National Union of Rail, Maritime & Transport Workers Alex Gordon! The Fatherland drowned out by the Marseillaise President Putin? Just a thought. I suppose that at the end of the day Russia is just currently going through what we did in our long history. This is off message but picture from Mistley Quay this morning at dawn of the drop dead gorgeous Stour Estuary (double click to bring up detail) . This weekend was R&R after the GLA election and the marathon. Two wonderful walks to Constable Country and Harwich. A little bit wet at times. Local people were genuinely concerned at the flooding in the valley from recent heavy rains (unheard of in their life times). Global warning?? I was born and raised near the Dee Estuary in North Wales so I always feel at home near tidal rivers. What was disconcerting is that behind the Quayside cottage I was renting was the "The Thorn Inn" (now a hotel serving great food) but where in the 17th Century, Witch-finder General, Matthew Hopkins is reputed to have lived and to have interrogated some of his victims. Some 300 women were tortured and murdered by Hopkins as "witches". How can somewhere so lovely and beautiful be the home of such evil? Congratulations to the new Socialist President of France, Francois Hollande! Does Socially Responsible Investment really matter? I think it does but twice now in recent weeks I have been in different meetings where Pension trustees (assets owners) have been urged to adopt responsible investment policies but I have been left wondering how seriously the financial services industry (as a whole) takes this issue? Or is this all just lip service? Socially responsible investment (SRI) is not just about ethnical or green investment. Rather it is the belief that in the long term if you invest in companies that are well governedand act in a responsible way (i.e. no child labour, doesn’t destroy the environment, treat its workers well, doesn’t bribe public officials etc) then they will produce superior returns than companies who do not. Nearly all large fund managers would claim to invest in a socially responsible way (and of course they would say this wouldn’t they!) yet many do little or nothing about it? Do they really just see RSI as a marketing tool to take in gullible pension trustees when privately they either think it makes no difference or even harms investment returns? When you challenge them about this they blame us the pension trustees for not being interested in SRI and not making it a priority. Which if true would be a fair comment. But surely the reason why pension trustees don’t appear to be interested in RSI is that many of our professional investment advisors do not tell us that this is a key issue? They may talk at length (rightly) about asset allocation and (wrongly) about the relative merits of particular fund managers and the latest “star performers” but little or nothing about SRI. Trustees are very dependent upon professional advisers. Probably too dependent but that is another question. Yet until the professional advisers start making a real issue out of SRI and hammer home the benefits then you must assume that they don’t really believe it makes any difference to investment returns. So if they don’t think SRI matters then don’t be too surprised if the trustees don’t either. Boris wins, London loses and do all political careers end in failure? So it was a close run thing after all. Ken loses to Boris by a 3% tiny margin. It was not all bad. 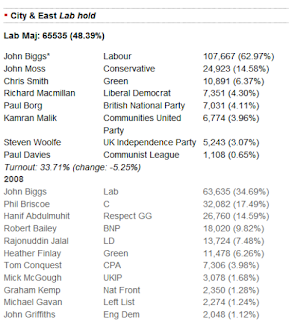 Labour did very well nationally winning 823 Council seats, it won Birmingham and saw off the nats in Glasgow. Labour picks up 2 extra seats in the London Assembly (but not enough to block the Mayors budget). Most importantly Labour has began to win in parts of the South East of England. It needs to win outside its traditional heartlands to stand any chance of victory in 2015. 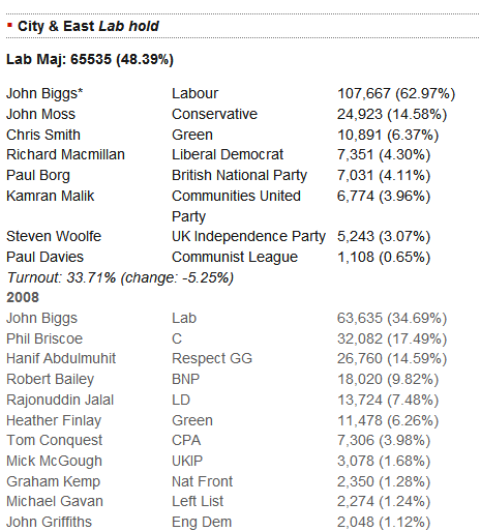 In City and East (Newham, Tower Hamlets, Barking & Dagenham and the City of London) our Labour Assembly member John Biggs was re-elected with over a 100,000 votes winning nearly 63% of turnout. I wonder about this famous quotation by Enoch Powell (about Conservative politician Joseph Chamberlain) "All political lives, unless they are cut off in midstream at a happy juncture, end in failure, because that is the nature of politics and of human affairs". Is this true? Ken himself I note has said he will not stand again for election but not that he is retiring. I can't imagine him ever giving up politics as long as he has breath in his body so watch this space and see what happens. Anyway, roll on European elections 2014. It was a great day. The rain held off (only a little bit of drizzle now and then - nothing like what we have had in recent weeks). Collage Picture of key West Ham Labour activists John Whitworth, Montrose Matty, Councillor Ron Manley and Freda Bourne (double click to bring up detail). I only heard one negative political comment all day from the hundreds we came in contact with (an attack on Ed Miliband coupled with a tease about "Red Ken"). The majority of "West Ham-mers" were genuinely open and enthusiastic about voting for Ken and Labour (although one person said she would normally vote Labour but she use to be a waitress and she once served him but he didn't give her a tip! I said I am sure that there must have been some sort of a misunderstanding). The ward is a traditional Labour heartland (as is most of Newham) and the support for the Party amongst all parts of the community is genuinely humbling. Afterwards we went for a beer and a curry in the excellent Manus Palm Grove Restaurant in West Ham Lane. The London Count does not start until tomorrow morning and the results not expected until late Friday. I am sure that Labour will do well but turnout is key. Will Tory supporters do what Labour supporters do when they are "unhappy" with a Labour Government and sit on their hands and not vote??? London: Send Cameron & Clegg a message by Sacking Boris! Not only in London but up and down the Country people should vote Labour to make this Tory Government stop and think again about its policies. In London the Labour candidate Ken Livingstone will cut Bus and Train fares, restore Police numbers, EMA and increase the supply of affordable housing. There is no real alternative to the Tories but the Labour Party. In London due to PR every single vote will count. Don't let Boris continue to destroy London. Send a message to this Tory Government. Turn out of voters today will mean everything. So get out and Vote Labour! Picture is from last night's phone bank on the 5th floor of the UNISON HQ in Euston. After some previous teething problems this high tech system really worked. The software enables you to go from call to call to call entering information via clicks on a mouse. We made over 500 calls to UNISON members in Tower Hamlets. Far more than if we had to use the traditional pen and paper system. At home recently I have been tele-canvassing my ward and it is so slow and cumbersome. Then you have to get the information manually inputted into Contact Creator (the Labour Party Election computer programme). This is exactly the sort of "hands on" political organising that trade unions need to do. Instead of just writing cheques and making supportive statements we need to be out there engaging with our members. Interestingly members on the whole were pleased to be contacted by their union and I had some decent conversations with them about a number of issues not just elections. So I think its good for the Union to have this contact with our members as well. "UNISON members in the South West are taking action to highlight the threat to the services currently provided by NHS Direct. Nursing and Health advisors providing NHS Direct helpline services to Cornwall and the South West based at Exeter are today (1 May) holding a ‘work-in’ in protest against the Government’s plans to replace NHS Direct with a service that has not been properly evaluated. From midnight last night until to midnight tonight, NHS Direct staff in Exeter are staging a ‘work-in’, with extra staff voluntarily coming in, in their own time, to help staff the NHS Direct phone lines. The protest is over the roll out of the 111 service which will replace NHS Direct. The union is deeply concerned that the roll out has not been properly evaluated, and could compromise the level of out of hours service that patients receive, as well as pile extra pressure onto other NHS services such as A&E and GP surgeries. The main centre is at Exeter, but they will be joined by nurses and health advisors from Bristol, Plymouth, Torquay, Taunton and Truro. During that time, they expect call rates to increase between 10% and 13% tomorrow. “UNISON nurses and health advisors will be taking action on Mayday today, to urge the Department of Health to stop the roll out of the proposed 111 service until it has been fully evaluated. “UNISON is particularly concerned that the new 111 service has fewer nurses available to take calls and therefore unqualified staff will be unable to carry out vital clinical assessments. This will inevitably lead to a huge increase in accident and emergency department attendances, ambulance call outs and patients referred to GP surgeries. 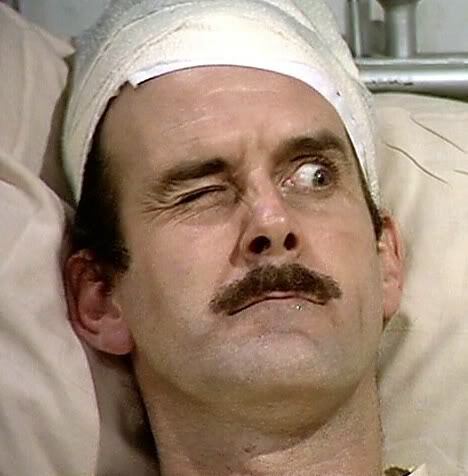 “We fear that the increase volume of patient turn-up at the regions A&E departments will push many to breaking point. We estimate up to 50 extra patients a day could present themselves to A&E departments and 1,000 extra ambulance call outs. We’ve also looked at the costs involved in replacing NHS Direct with the new 111 service and estimate the costs will run into millions of pounds; not to mention the cost to the quality of services provided. UNISON and other health organisations such as the BMA are calling for a pause in the implementation of the 111 service in order to consider the implications for urgent out of hours care as a whole." The non-political campaign group "My Fair London" has sent out this email yesterday to supporters following the refusal of Tory Mayoral candidate Boris Johnson to pledge to take action to reduce inequality. Vote anyone but Boris? Needless to say. I agree! 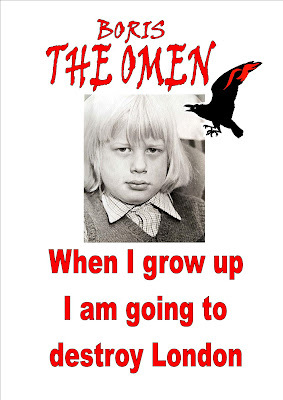 (but the only way to stop Boris is to put Ken 1st or 2nd on your ballot paper). 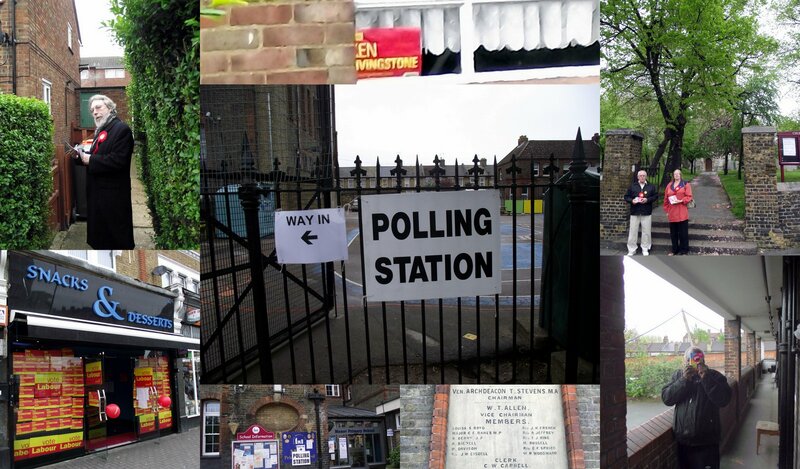 This Thursday Londoners will have your chance to chose the next Mayor of London. As a signatory of our e-petition you want the next mayor to take action on inequality in London. Ken Livingstone, Jenny Jones, and Brian Paddick all agree and have signed up to our five-point plan of action. Only one of the main candidates is not prepared to take action on inequality: Boris Johnson. So we're calling on you to vote against Boris on 3rd May. the vast majority of Londoners back action to reduce this gap. Three of the candidates - Ken, Jenny and Brian - listened and responded by signing up to our five-point plan. One candidate - Boris - ignored both the evidence and Londoners' views. It's time to send a message: since Boris doesn't care about inequality in London, he won't get my vote. But this is not just about decisions made in London. The result of the mayoral election sends a message to the politicians in Westminster. They make the key decisions that drive inequality in London. We need a mayor who lobbies the government to address the gulf between rich and poor that divides Londoners. Boris has spent recent years doing the opposite: he has been a consistent critic of the 50p tax rate. He has finally got his way: George Osborne's budget slashed the top rate of tax for those earning £150,000 or more. This will put an average of £10,000 back in the pockets of each top rate tax payer. Not content with that, it seems Boris wants the Chancellor to slash taxes for the rich even further. In an interview for the Sunday Telegraph this weekend Boris called for making London more tax competitive, interpreted by most commentators as a thinly-veiled reference to the need to cut taxes for the highest earners further. With the mayoral race neck and neck, Boris' victory is far from guaranteed. It's time to say no to soaring inequality and no to Boris Johnson. You are one of 850 Londoners who have signed our online e-petition. Thank you! You have been critical to the success of our campaign. There is still time before the election to get more Londoners to sign up. Please take 2 minutes to email 10 of your friends, family and colleagues to sign our e-petition at http://www.myfairlondon.org.uk/sign-the-petition/.